Can You Create a Bonsai Tree From a Lemon Cypress? 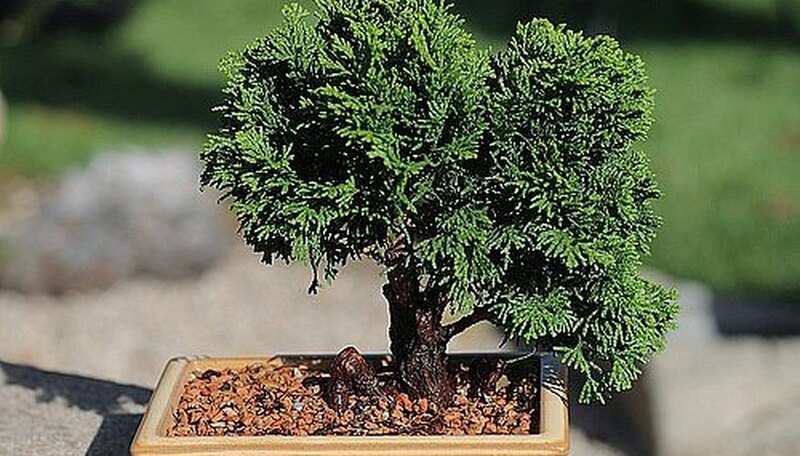 Bonsai trees have a unique look that is broad and flat at the top with bare branches below. Creating a small bonsai tree takes years of root pruning and proper growth techniques. However, the shape of the bonsai tree is attractive on a larger scale and a shrub can be pruned in the garden to resemble a bonsai tree. Good candidates for shaping into a bonsai form are privets, hollies, and ligustrums. Choose a shrub that has several larger main stems or trunks and lots of thick top growth. Trim out all the small branches that are attached to the main limbs and any small limbs that are sprouting from the ground around the main trunks or stems. The main limbs or trunks should be bare up to the level where you want the green top to begin. Identify any long or unruly branches coming from the top of the shrub. Cut these branches all the way back to the main branches. Do not simply shear off the top of the shrub, as this will create an unnatural look that will not look like a bonsai tree. Rake away all cut limbs, leaves and branches. Step back and look at the shrub and cut any small limbs left on the main branches. Your shrub should have the look of a large bonsai tree when you are finished. Bonsai originated in China between 1,000 and 2,000 years ago. The art was transmitted to Japan with Chinese Chan Buddhism in the 12th century and has become closely associated with Japanese Zen Buddhism. Almost any tree that grows locally is a potential candidate for pot growing and training, or bonsai. 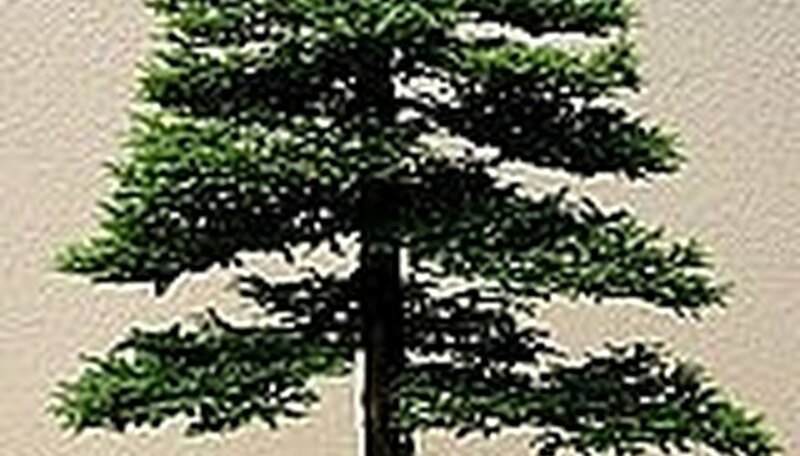 Common trees include junipers, pines, maples, oaks, azaleas, tea plants or any tree or bush that develops woody stems. Bonsais are grown according to loose styles; however, many award-winning bonsai deviate from traditional styles. Common classic styles include formal upright, informal upright, cascade, semi-cascade, windswept, literati, root on rock, driftwood and multiple-trunk. 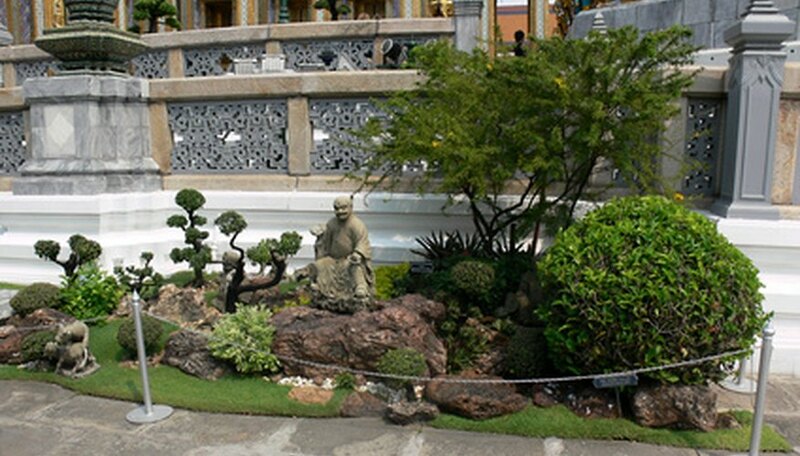 Bonsai as part of a miniature landscape is usually associated with the Chinese style. In this style, rocks become miniature mountains and small clay figurines or buildings create a sense of idyllic landscape in miniature. 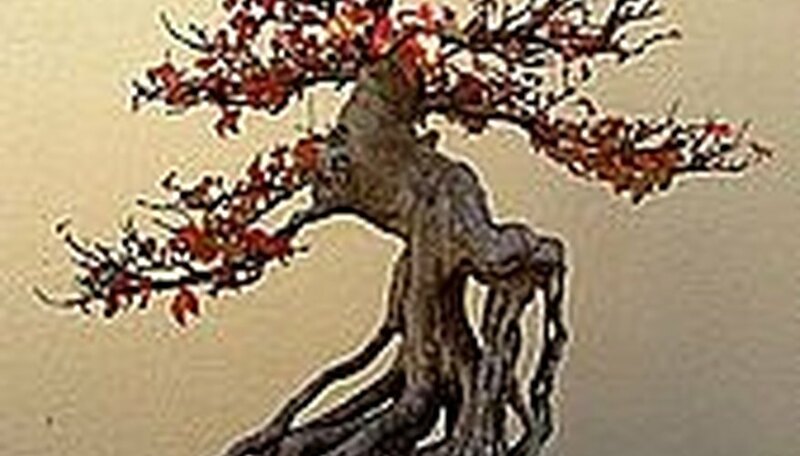 Japanese-style bonsai evolved over the 20th century to include many aspects of Zen Buddhist design. In Zen design, all aspects of the tree that are not necessary are removed, focusing on the natural shape and lines in the tree. Cycad palm tress, which are sometimes cut into bonsai shapes, are poisonous to cats. Because bonsai plants can be made from a number of different species, check with your retailer or the ASPCA before bringing the plant home. 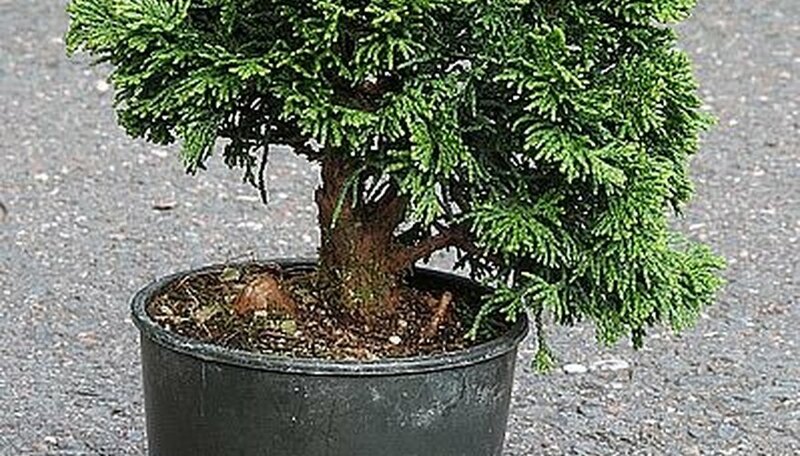 More commonly used as topiary plants, lemon cypress can make suitable bonsai trees because they respond well to training. They require high light and achieve a golden color in full sun. Lemon cypress cannot survive winters outside below USDA hardiness zone 7. One of the foundations of trimming bonsai is to achieve a Scalene Triangle, where each of the three sides is a different length. 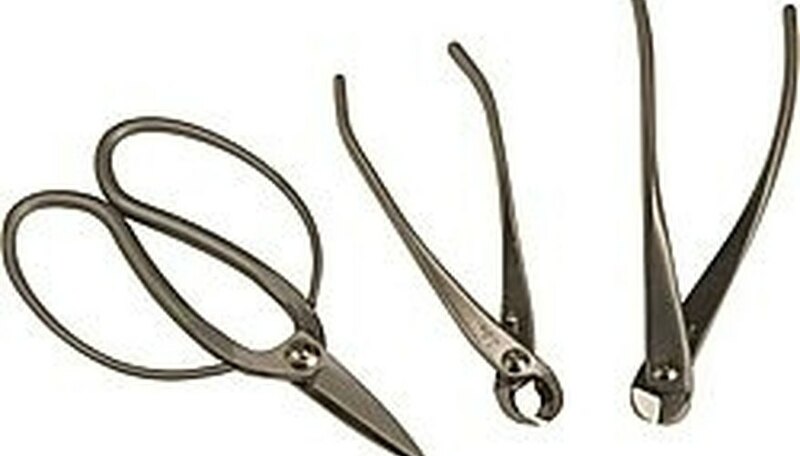 Invest in real bonsai pruping shears. Garden shears from the local hardware store will not work. Bonsai shears will trim branches flush to the trunk and minimize scarring. When starting to trim your bonsai, step back multiple times until you can fully envision what you want your tree to look like. Pick one side of the tree that will work for the "show" side (like picking the best side of a Christmas tree to decorate!). Working with the best side forward, start by taking out the largest branches first. To achieve symmetry, create a pattern so that large branches occur on opposite side of the tree at different heights. In essence, you don't want two large branches on the same plane, but instead looking like steps that ascend to the top of the tree. Leave a few large branches on the back side of the tree to achieve a sense of "depth". Using your shears and fingernails (for small buds), trim off most of the branches and buds that point downwards. At this point, pay closer attention to the scalene triangle in your tree and adjust the length of branches as needed. Keep stepping back and envisioning your tree as it will look after wrapping it with wire for training. You can always take away branches later, but you can never put them back! So go slow. Purchase an orange bonsai from a reputable grower in early spring. Make sure that the company ships it directly to you as it will have a better hope of survival. Ideally, pick up the bonsai orange directly from the company. Place the bonsai orange in full sun outdoors. This plant does better if it resides outside from March to October (or as long as temperatures stay above 44 degrees Fahrenheit). If you decide to keep it indoors, place it in a well-ventilated, sunny area between 55 and 75 degrees Fahrenheit. Water the bonsai orange during the growing season. Allow the top of the dirt to dry slightly between waterings. Decrease watering in the winter, keeping the soil just moist enough so that it does not dry out completely. Fertilize the bonsai orange right after flowering with a complete all-purpose fertilizer diluted by half. This will encourage proper growth and fruit production. Re-pot the bonsai orange every two or three years into a slightly larger pot. This will keep the roots from becoming matted. According to Bonsai Gardener, bonsai trees, if properly maintained, can live for hundreds of years. The oldest known bonsai tree is a Japanese white pine that is around 400 years old. The second oldest is a Japanese red pine which is around 200 years old.